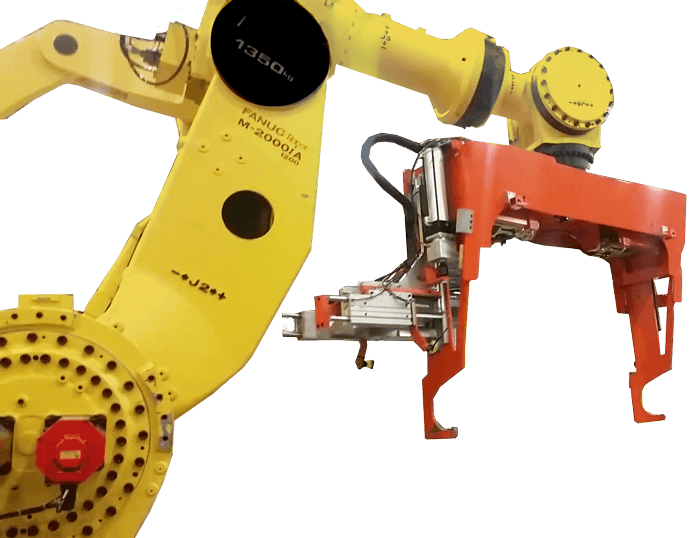 The FANUC M-410 robot series is designed for palletizing a wide array of products. The payload capacity available in the models runs up to 700 kg (1500 lbs). 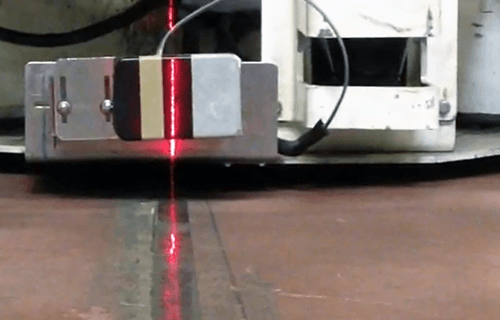 This payload capacity does not impair the robot’s ability to meet high rate requirements. 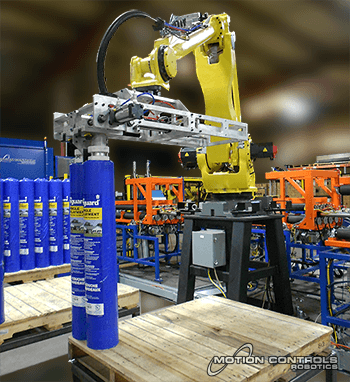 Palletizing – Motion Controls Robotics has systems for case palletizing, mixed load palletizing, and full layer palletizing processes. Bag Palletizing – Using proven bag handling end of arm tooling, MCRI has high speed bag palletizing operations. 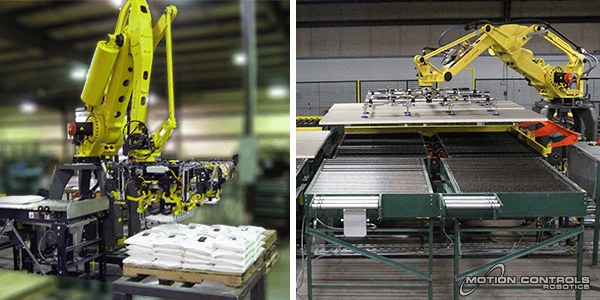 Roll Handling – Systems for slitting and/or palletizing rolls in either a vertical or horizontal orientation is another application for the M-410 series robots where MCRI has expertise. Board Handling – MCRI has the largest installed base of board handling systems throughout the country. We have a system to minimize production and packaging costs and improve quality for the manufacturers of building products. This system is perfect for large flat building products such as drywall, paneling, sheetrock, and plywood. 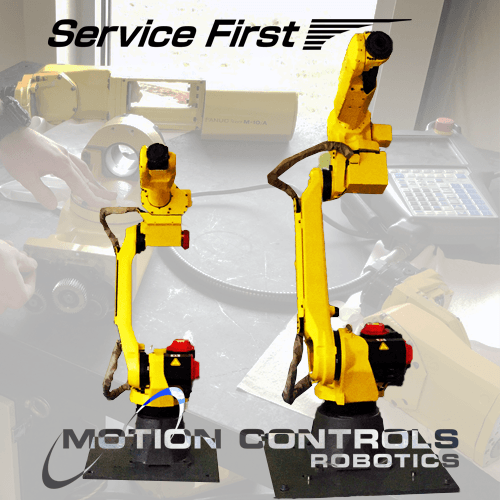 Depalletizing – Motion Controls Robotics has depalletizing systems for manufacturing and distribution facilities used for further processing or order fulfillment. Depalletizing is also used to load a machine or conveyor. 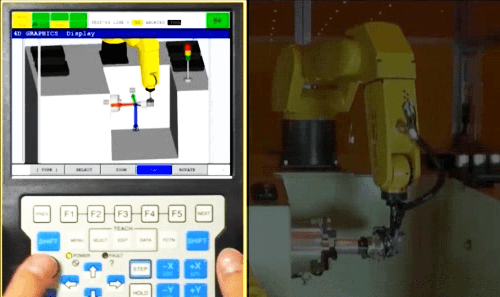 The 4 axis FANUC M-410 series has a small footprint and a long reach that allows for multiple operations in one work envelope. 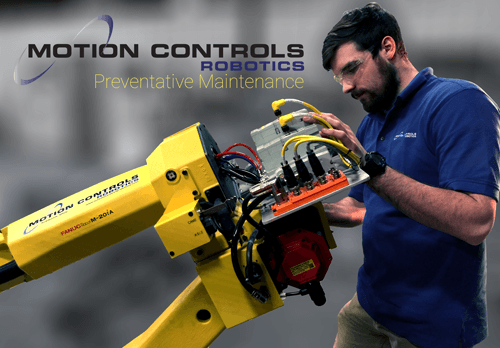 The robot is run with the popular R-30iB controller which is integrated into the base of the robot for extra space savings and flexibility. The M-410 series uses iPendant programming software that includes a user friendly interface. 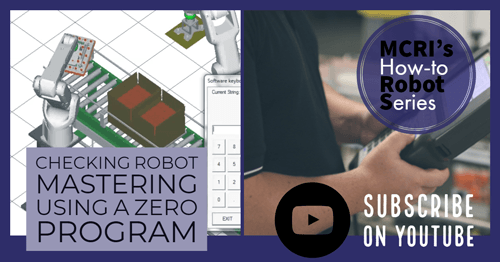 This robot also supports the PalletPRO software that optimizes palletizing performance. The precision and speed of the FANUC M-410 robot series is comparable to modern trains in its ability to remain dependable. The M410 series can help solve almost any palletizing puzzle in your facility. Request a brochure about our Case2Cube palletizing system or request a site visit so MCRI can help develop a palletizing system perfect for demanding plant operations.